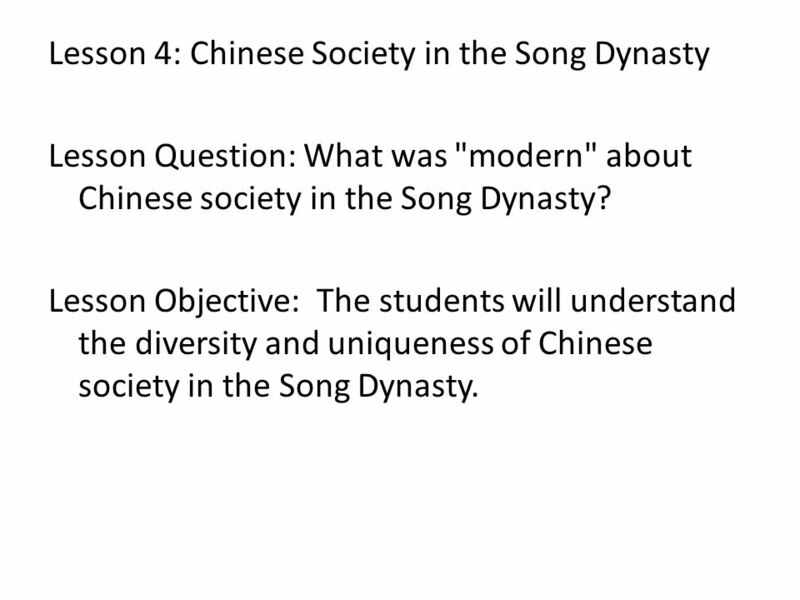 Lesson 4: Chinese Society in the Song Dynasty Lesson Question: What was "modern" about Chinese society in the Song Dynasty? Lesson Objective: The students. 1 Lesson 4: Chinese Society in the Song Dynasty Lesson Question: What was "modern" about Chinese society in the Song Dynasty? Lesson Objective: The students will understand the diversity and uniqueness of Chinese society in the Song Dynasty. 4 Scenario: The year is 1025 and you have just been crowned emperor/empress. Your hold on power is tenuous since 1) you are young and have never held an important position in the imperial government, 2) have a domineering mother who intends to rule China through you, and 3) have heard whisperings that your dynasty has lost the Mandate of Heaven due to a recent series of earthquakes in the south that have killed many thousands in a couple of hard-hit cities and disrupted manufacturing and trade in the region. Furthermore, embassaries from the Liao and Xixia kingdoms have arrived in your capital to announce a new alliance between the two peoples and demand a significant increase in the annual tribute to both kingdoms or else. You believe that you have six months at the most before these two powers could invade your territory with a joint-army. 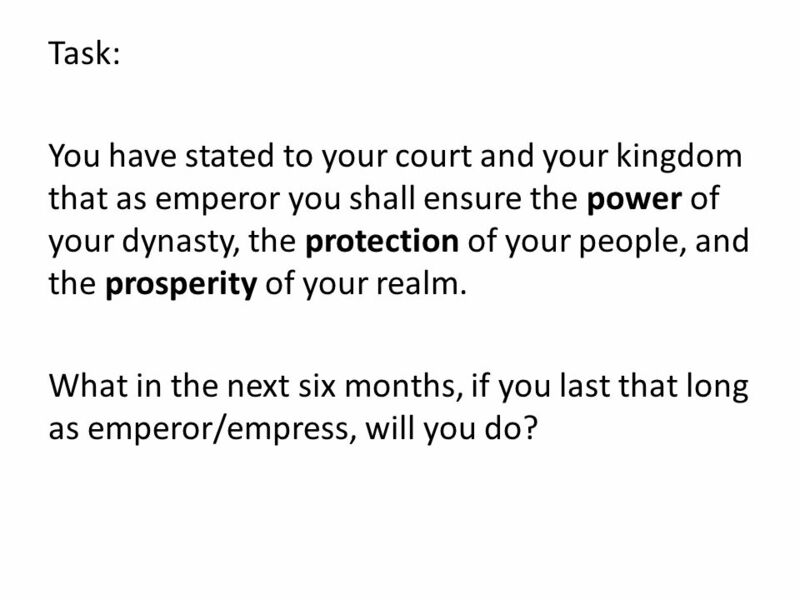 5 Task: You have stated to your court and your kingdom that as emperor you shall ensure the power of your dynasty, the protection of your people, and the prosperity of your realm. What in the next six months, if you last that long as emperor/empress, will you do? 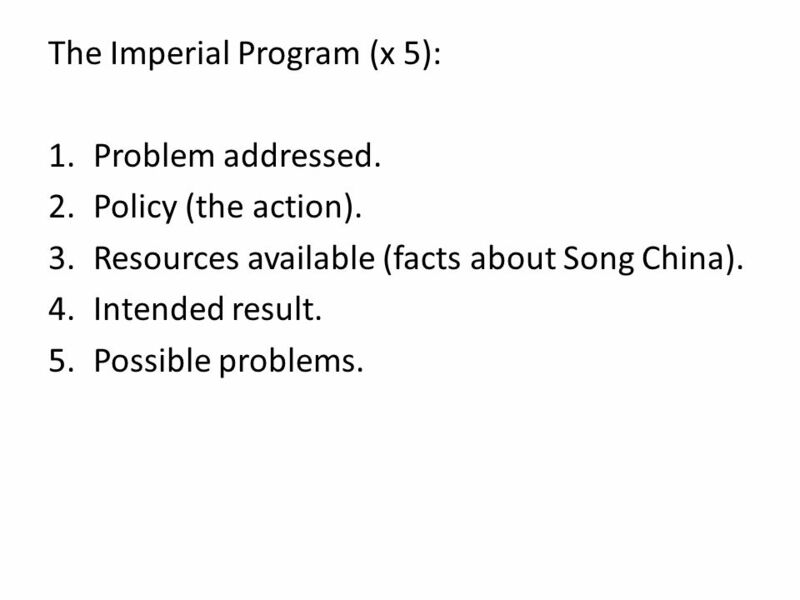 6 The Imperial Program (x 5): 1.Problem addressed. 2.Policy (the action). 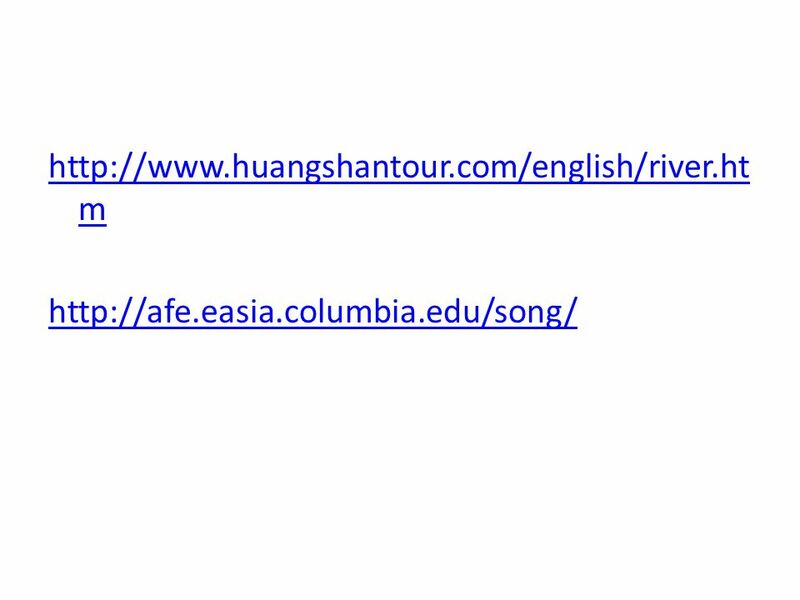 3.Resources available (facts about Song China). 4.Intended result. 5.Possible problems. 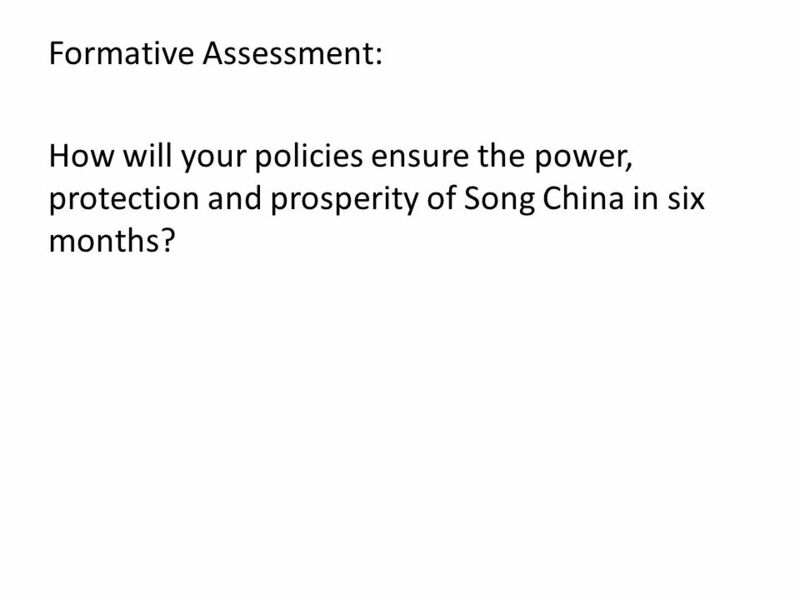 7 Formative Assessment: How will your policies ensure the power, protection and prosperity of Song China in six months? 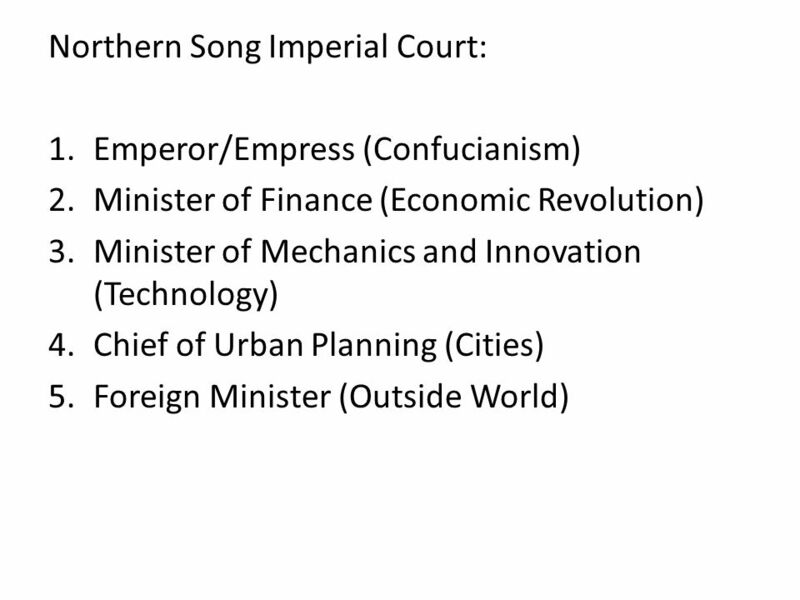 Download ppt "Lesson 4: Chinese Society in the Song Dynasty Lesson Question: What was "modern" about Chinese society in the Song Dynasty? Lesson Objective: The students." Imperial China China in the 19 th Century before the nationalist revolution in 1912 and the communist revolution in 1945 Imperial China. Tang and Song China Chapter 12 Section 1. Chapter 12 Section 1 (22 Slides) 1. Cultures of East Asia Section 1. Cultures of East Asia Section 1 Preview Starting Points Map: East Asia Main Idea / Reading Focus Sui and Tang Dynasties. Major Rulers of China The First Emperor The first dynasty of China was led by prince Zheng, the head of the Qin state. He unified his empire by defeating. Unit 2 Sui, Tang & Song Dynasties AP World History. Sui, Tang, and Song. Sui  Wendi unites N and S China  Restores strong central gov’t  China enters Golden Age. China 500 to 1000 AD. China Reunites Chapter 12 Section 1. Constructed Grand Canal 1,000 miles, connects the Yellow and Yangtze rivers Provided vital trade route between north and south Established a professional. THE HAN DYNASTY I can describe life in the Han Dynasty. How does this portrait exemplify the characteristics of Absolutism? E. Napp The Zhou and the Qin Dynasties In this lesson, students will be able to identify characteristics of the Zhou and Qin dynasties. Students will be. China & European Imperialism World History - Libertyville HS. THE QING DYNASTY Morgan Rutar Rebekah Brown. THE BEGINNING… Established in 1644 Established in 1644 Beijing was captured by LiZuheng Beijing was captured. The Ming Dynasty Section Rise of the Ming Dynasty  Kublai Khan died in  A period of weakness followed and Chinese people showed how much. Lesson 8.01 Aftermath of the fall of the Han Dynasty After the fall of the Han Dynasty----chaos: 1)The empire split into three parts. 2) Invaders swarmed. Ming Dynasty Simulation. 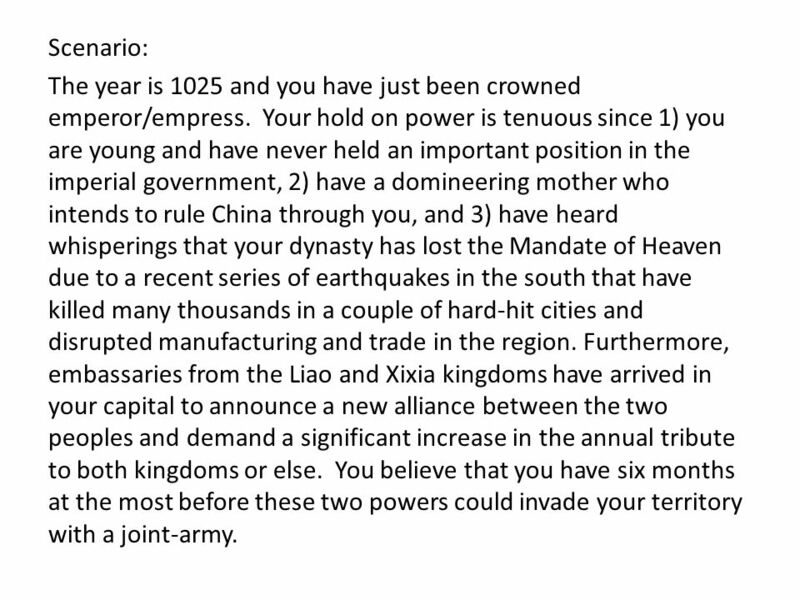 You are going to advise the Emperor on the many problems that were facing the Ming Dynasty in the early years. We will compare.